The great thing about moving to a new area is that you don’t feel lazy about exploring places on your doorstep. Having moved to Devon at New Year we are still wandering around like tourists so it only feels natural to check out the local sights. Last weekend we paid a visit to our closest English Heritage property, Dartmouth Castle. We had intended to visit when we were in Devon last summer but the weather was terrible so we decided to give it a miss. Last weekend wasn’t much better to be honest but we took advantage of the break the the rain on Sunday morning, abandoned what’s left of our unpacked belongings and set out for some fresh air. Dartmouth Castle dates back to 1388 when it was built at the entrance of the River Dart to protect the town from French raids. Over the centuries towers and batteries were added, giving the guns longer range into the English Channel. Today very little of the original fortification, which resembled a small castle and gives the site its name, exists. You can however tour the Battery, Casemates and Gun Tower. These were used as coastal defences right up until World War II and were finally handed over to the state in 1955. We arrived late morning and were among only a handful of people looking around. This was handy for negotiating all the narrow stairwells with our girls. There was quite a lot of ducking involved, much to the amusement of Tin Box Baby who was being carried around in our Baby Weavers back pack by Mr Tin Box. Tin Box Tot isn’t a quiet child so loved making high pitched squeaks in all the echoing corridors. The powder store in particular was an ideal place to run around and play hide and seek. In the Gun Tower there were displays for visitors to touch, feel and try on, as well as a nice collection of history books aimed at kids like Horrible Histories. Tin Box Tot thought it was great fun to try on the medieval helmet, which made her look like a mini Darth Vader! At the top of the Gun Tower there is an open platform with a turret that you can climb up inside. Tin Box Tot seemed to like this part of the castle the best and went up and down the turret stairs with me in hot pursuit several times. The views off the English Channel as well as back down the River Dart to Kingswear and Dartmouth are beautiful, and in stark contrast to the original lethal purpose of the building. 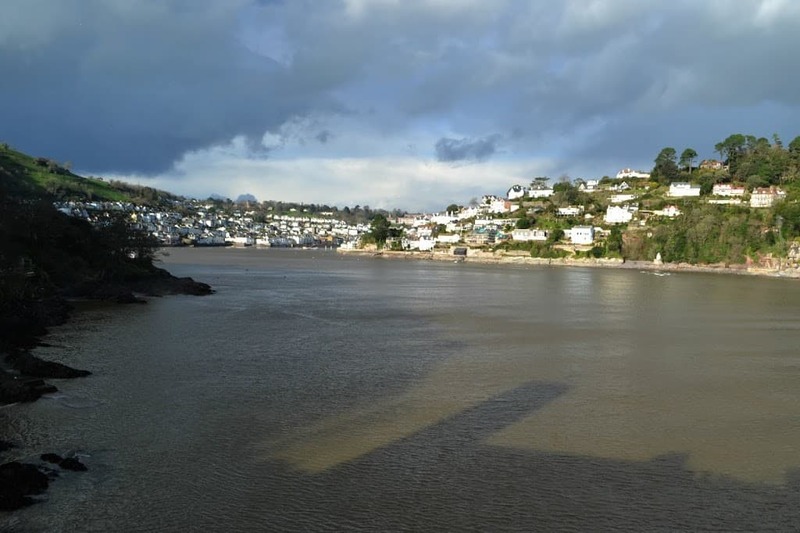 The tower stands at the narrowest part of the entrance to the River Dart which would have made any unwelcome ships extremely vulnerable to short-range fire from the guns. A chain also stretched across the river from here to stop enemy vessels passing. We were at Dartmouth Castle for about an hour before the rain set in again. If the weather had been with us we could have extended our visit by looking at the ruins of the original fortification and taking a walk down the cliff to Castle Cove. These are all things we can do another day as they are accessible to the general public. Dartmouth Castle can be reached by car along a sometimes narrow road from the town centre. In peak holiday season I can imagine the road being very busy. On a blustery January day we had no problems driving right up to the small car park at the entrance to the castle. There’s a larger car park further back up the road. 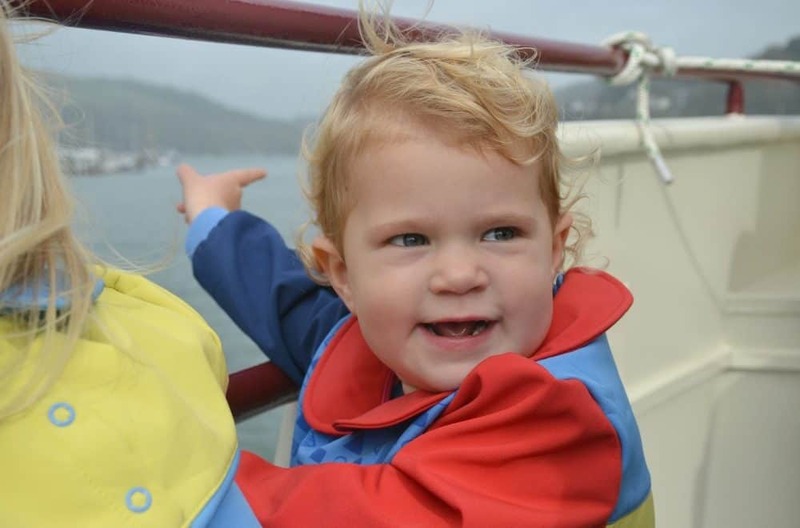 Another option to reach the castle is a boat trip from Dartmouth town quay when the weather is better. The castle is open weekends only until 24 March 2016 and costs £16.40 for a family of two adults and up to three children (with a Gift Aid donation). We paid for two adult tickets at £6.30 each (with Gift Aid) as both our girls were under five and therefore free. For all the latest opening times and prices visit the English Heritage website. The cafe was not open during our visit, which meant no baby bottle warming facilities. So check before you visit if you’re going to need this. The toilets are at the end of the car park and have no baby chaining facilities. It’s not advised to take a pushchair around the castle, so wear babies and toddlers who are unable to walk. There are lots of low ceilings and narrow stairwells to negotiate so make sure you have lots of hands free to help small children. Have you ever visited Dartmouth or the castle? I haven't visited Dartmouth or the castle, but they're one of our favourite days out. I especially like places that have put a little effort into the historical reconstruction, like this one. I've enjoyed your photos of Dartmouth Castle on Instagram so it's good to read the post now. 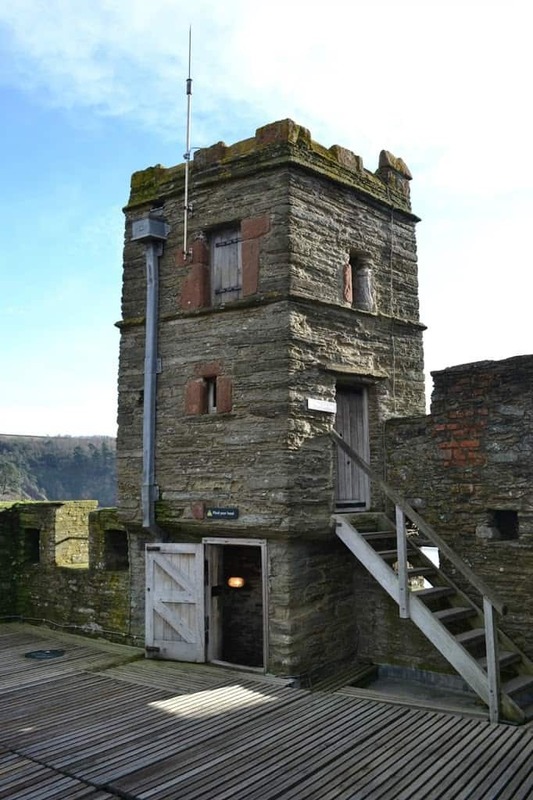 We'd love to go – we're a bit obsessed with castles in our house! This looks like a great day out – even in this weather. We went to Warwick castle back in September and the boys loved running around and exploring. We love castles too! Thanks so much for linking up to #KCACOLS I hope to see you back again on Sunday. What an exciting place to explore! I think my three would enjoy exploring the echoy corridors too!